Well, it has been awhile since I've had a decadent cake post ;-) I made this for my husband's birthday a few weeks ago, and it's something I've wanted to try for awhile now. Actually, my son had a choice of this cake or the Spaghetti and Meatball cake for his birthday in March but the novelty factor of the latter cake was too much for him to resist! I've really combined 2 different cakes here that I've seen around and wanted to try. 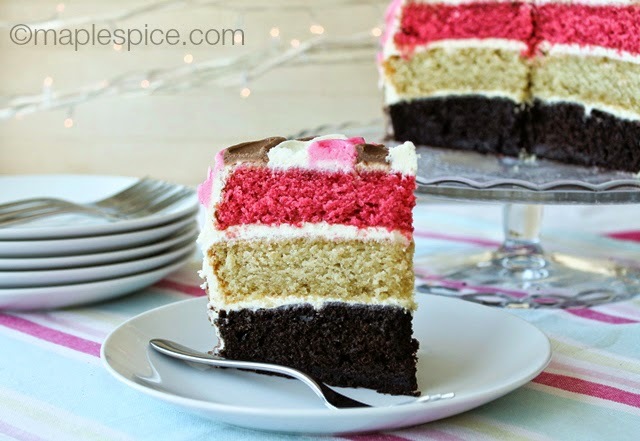 First the cake itself - Neapolitan cake: fairly straightforward, just a layer of chocolate, vanilla and strawberry cakes. 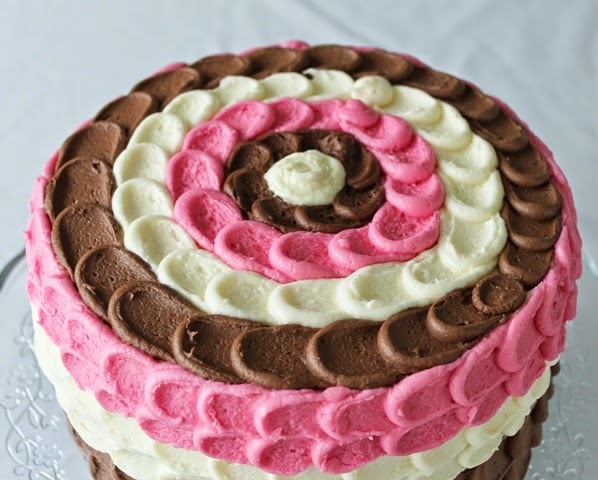 Then I saw this petal frosting design on this Bakewell Ombre Cake on BBC Good Food and loved the look of it. 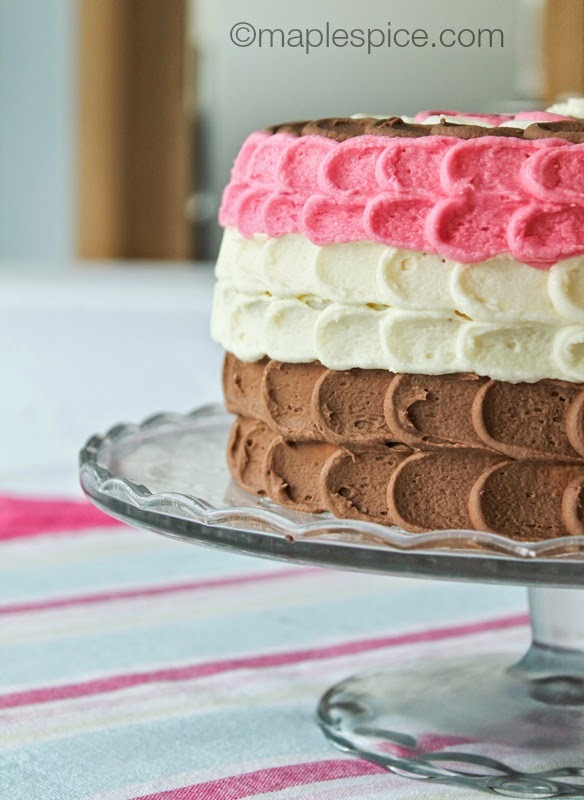 Thankfully there are lots of tutorials out there on how to do this but really, you're just piping a blob of frosting onto the cake then smearing it to the side with the back of a spoon or small off-set spatula. Time consuming, yes, but not difficult. Grease and line the base of an 7" round cake tin with baking paper. Preheat the oven to 180C/350F. Whisk all the dry ingredients together. In a separate bowl whisk together all the wet ingredients. Pour the wet into the dry and whisk until just smooth - don't overdue it. Scrape the batter into the prepared tin and bake for 30 minutes or until firm but bouncy on top and a toothpick inserted comes out clean. Leave to fully cool in the tin. Preheat the oven to 180C / 350F. Grease and line an 7” cake pan with baking paper. In a large bowl beat together the butter and sugar until creamy. In another bowl sift together the flour, baking powder, baking soda and salt. In a large measuring cup whisk together the soy yogurt, sparkling water, vanilla and vinegar. Pour and scrape the batter into the prepared tin, level off the top and pop it into the preheated oven for about 40 minutes. It should be firm on top, bounce back a little when pressed on top and a wooden skewer inserted in the centre should come out clean with just a few crumbs attached. Remove from the oven and leave to fully cool on a wire rack, in the tin. • tiny bit of pink food colouring paste* - check it's vegan of course! * I used Wilton food colouring paste in Rose, it's labelled vegetarian and is also vegan according to this site selling it. In a large bowl beat together the butter and sugar until creamy. In another bowl sift together the flour, baking powder, baking soda and salt. In a large measuring cup whisk together the soy yogurt, sparkling water, strawberry extract, paste colour and vinegar. Now, for the frostings I'm actually going to give you quantities for much more than you will need as this isn't the kind of cake you want to run out of frosting halfway through. 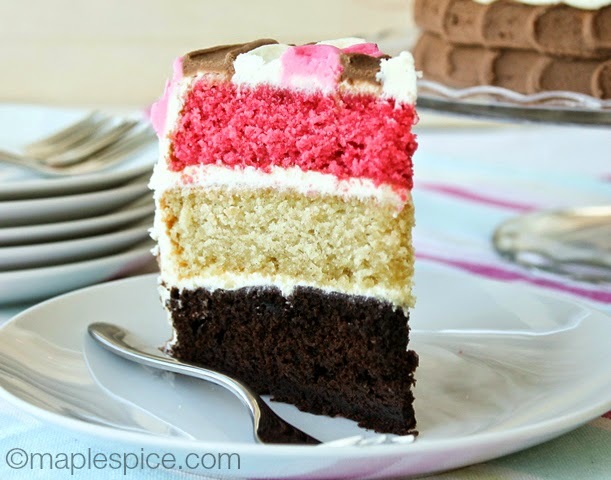 Especially with the pink layer as you don't want to try and match the colour in a second batch! Soften the butter then start adding the icing sugar, mixing well after each addition until smooth. Add the vanilla and mix well, when it starts getting dry start adding some of the milk alternately with the icing sugar until you have a spreadable frosting. If you need to add a bit more icing sugar and/or milk do so. Remove the cakes from the tins and peel off the baking paper. 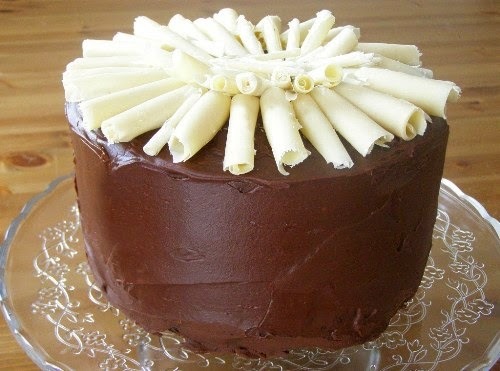 Place the chocolate cake on a cake stand or serving plate then spread some of the vanilla buttercream on top - not too much remember that there will be quite a bit of frosting going on the outside of this cake. 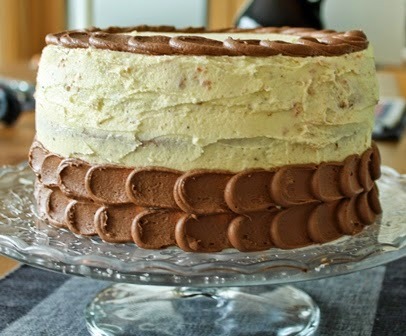 Place the vanilla cake on top and spread some more vanilla buttercream on top of this. Finally place the strawberry cake on top - try and make sure the flattest side is on top for an even looking cake. This is the only photo I got of the cake whilst being decorated as it was all a bit too hands on! Note the crumbs in my frosting there, not a problem. Now, ideally, you want to make all 3 frostings and get them into piping bags each with an 11 or 12mm plain round tip (I only had an 11mm round tip so used that and found it perfect, tutorials recommend a 12mm). But, I only have 1 piping bag and the 1 tip and I really didn't want to go out and buy 2 more (those tips are expensive!!) So I had to frost the cake in 3 stages. 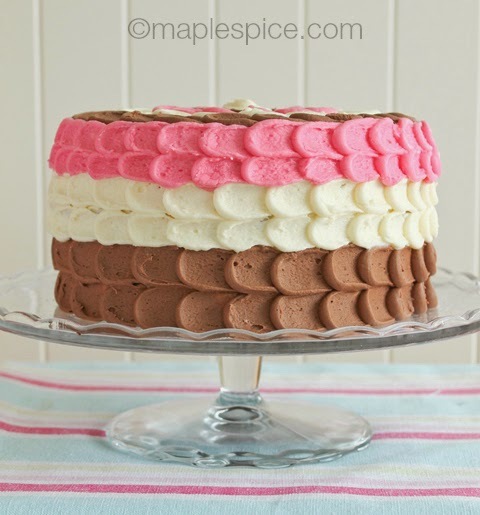 First, I made the chocolate frosting and piped it all over in the petal design, including the top of the cake! Washed the bag and tip and made the vanilla, piped that all over, then did the same with the strawberry. Very time consuming, yes, but this is what I'll do to save a few bob ;-) So yes, ideally, have all 3 ready to go in bags but if you are like me and only have the one, you can do it my way. Sift together the icing sugar and cocoa powder in a bowl. In a stand mixer cream together the butter and some of the icing sugar, when it starts getting dry add the melted chocolate slowly while the machine is running and quickly mix it in until incorporated. Add the rest of the icing sugar and add some dairy free milk if the mixture is too thick, you want a thick yet spreadable frosting. Soften the butter and start adding icing sugar, mixing well to keep it smooth, mix in the vanilla/strawberry extract and when it starts to get dry start adding a bit of milk as needed. For the strawberry add the colouring and mix well. Again you want a thick yet spreadable frosting. Thankfully, there a lots of tutorial videos out there to show the technique. I followed Edd Kimber's instructions even though I wasn't doing the ombre effect. It is really easy though, just pipe a blog and smear it. Really, that's all there is to it. 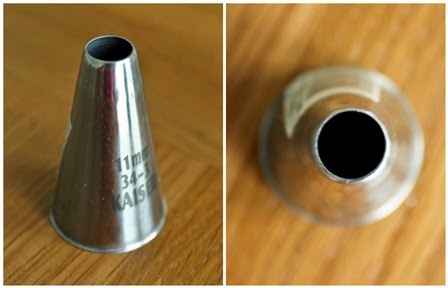 I suggest doing a couple practise ones on a plate before you put it on the cake though. I had to try a few different spoons and little offset spatulas before I found one that worked best. 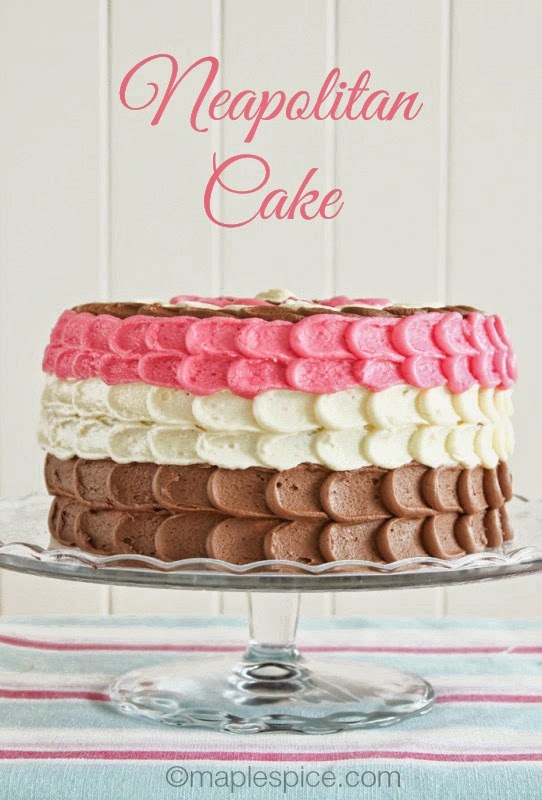 Also, remember that where you start and finish won't have a perfect blob, in other words, there will be a seam so try and start and finish each frosting layer in the same place and that can be the 'back' of the cake. How I decorated the top. And that's it! 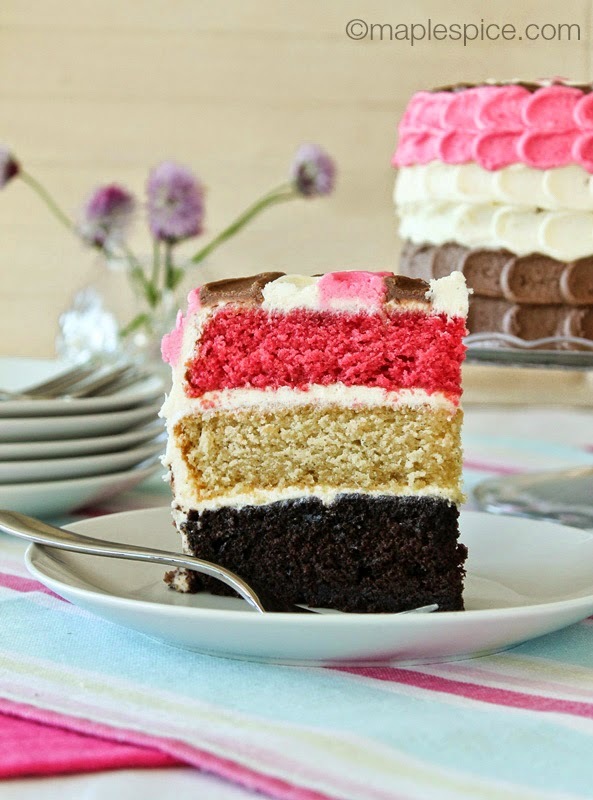 It might take awhile but it really is a very delicious cake and so visually striking. Perfect for a one-off special occasion. Thanks so much :-) And yes! I forgot as well how awkward and messy measuring things like butter into cups is, also for sticky things like molasses...so nice to just throw it in a bowl on a scale! 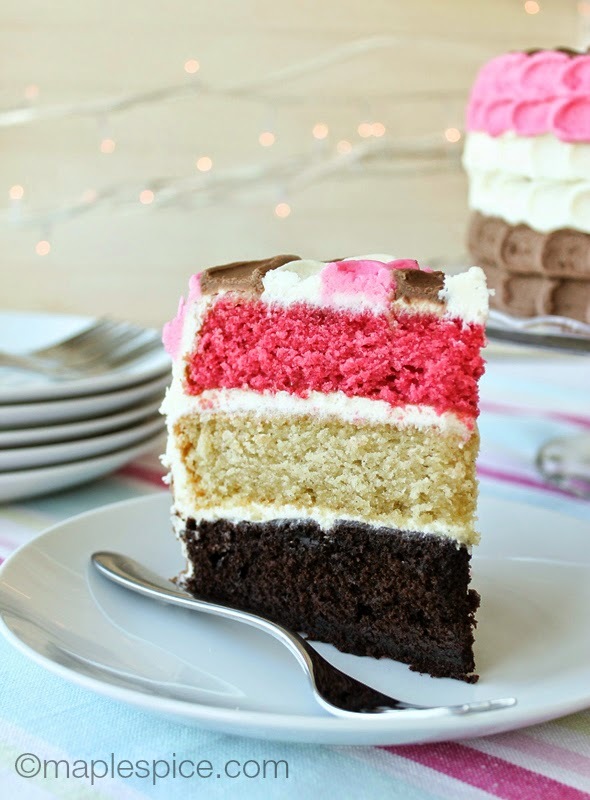 Such a gorgeous cake! Thanks for the link to the tutorial. 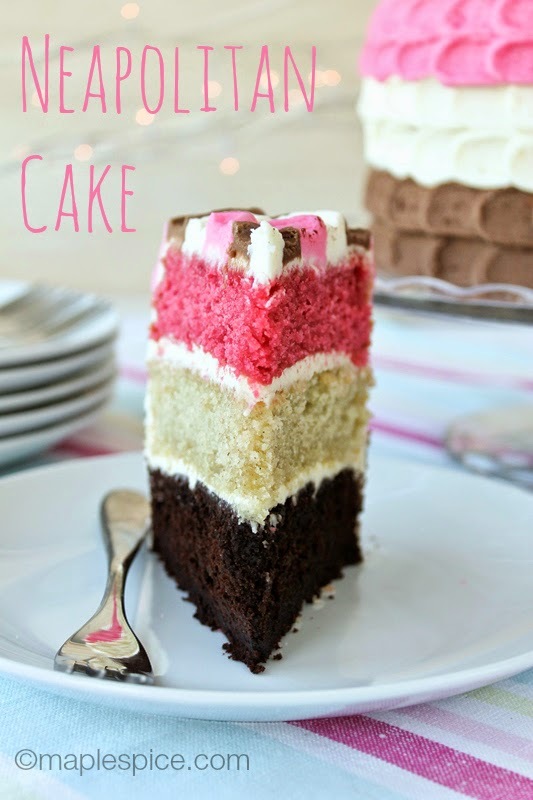 it really is a breathtaking cake... love the pink top layer!... I saw that video too and have always wanted to give it a go and I think the way you've done it is a great, far less complicated version but still beautiful!